SCVHistory.com LW3484 | Acton | Envelope Addressed to Fred W. Gross, 9-22-1908. 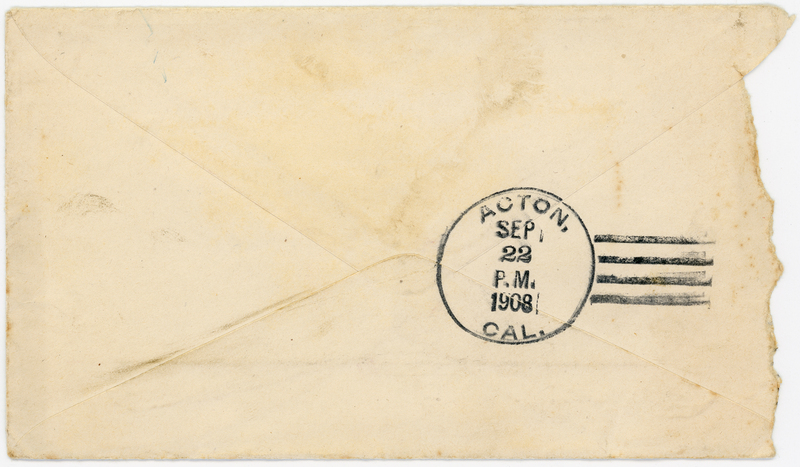 Envelope with first-class (2-cent) postage addressed to rancher Fred W. Gross (presumably Junior) in care of the Acton postoffice. 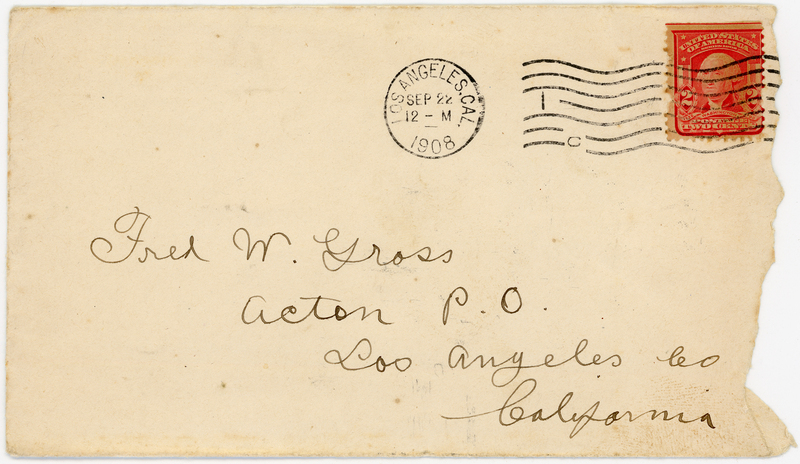 Mailed from Los Angeles; postmarked at Los Angeles and (on back) upon receipt at Acton the same day, September 22, 1908. 1903-1904: Fred Gross Sr. and Family, Builders, Farmers, Ravenna Railroad Pumping Plant of 1904. It was in the early 1890s that the Fred Gross Sr. family began to have an influence in the development of Acton and Ravenna. Years of hard work at their ranch near Ravenna saw the establishment of a model dairy and alfalfa ranch with Fred Gross Jr., age 21 in 1901, actually taking almost complete charge while his father was thus free to spend more time in Los Angeles running his already established business there — with frequent returns to Ravenna to enjoy the ranch, a good place for family gatherings with mother and father, son Fred Gross Jr., son George and wife, daughter Minnie Bloomfield and husband of Carpinteria. Early in 1903, Fred Gross Jr. decided to leave Acton, go to Los Angeles and attend Woodbury Business College — age 23. Fred Gross Sr. came back to Acton to take over the ranch during this time. While pursuing his commercial course, Fred Jr. decided to add telegraphy to his plan of study with the expectation of becoming a first-class brass pounder — his theory: "the price of success is constant practice." The young people of Ravenna and Acton were sorry to see Fred leave; they were just not sure he would return, and they knew they would miss him at their dances, at church and at community events. However, they knew they had a good substitute with Fred Gross Sr. in their midst! Course completed, and Fred Gross Jr. returned to the ranch in July 1904, just in time to get involved with the Southern Pacific Company plans to provide a much-needed water stop for their engines at the Ravenna Railroad Station. The S.P. Co. contracted with the Gross family to develop water on the Gross ranch and were successful even without further supplementary water from Mill Creek Canyon. Fred Gross Jr. put his planning mind to work, installed two gasoline engine pumps, planned the water line to the S.P. tank and began running the two pumps day and night to supply the needed water at the Ravenna Station — an ample supply was provided as Fred Gross Jr. kept the pumps in operation. This turned out to be an important occupation of the Gross family, with brother George Gross doing his part when needed. When "Old Man Dolores Salanasia," longtime Mexican resident of Ravenna, died in his sleep in November 1905, it was Fred Gross Jr. who took charge of arrangements for this friendly man who claimed to be over 120 years of age. He had arrived at that age by continual smoking of the cigarette and eating beef. Fred Gross Jr. gave an address and a prayer as quite a few old friends (including L. Ruiz) followed the old man to his last resting place in the Ravenna Cemetery. Later, Fred Gross Jr. arranged a collection and a suitable monument for this lone man who was liked by everyone. Fred Gross did not strike oil on his property, but oil struck it on May 18, 1904, when there was a train wreck and two cars of oil dumped over in the field with quite a lake of oil the result. "Everybody and their wife is stocking up to doctor henroosts and paint roofs or any old thing that oil is supposed to be good for — handy to have around." Fred Gross Jr. put up a sign: "Free oil. Help yourself — I am no hog!" Fred Gross Jr., pioneer of Acton and Ravenna, a student, hard worker, kindly, thoughful, fun-loving, good sense of humor — a contributor to our pioneer days. LW3484: 9600 dpi jpeg from original envelope purchased 2018 by Leon Worden.